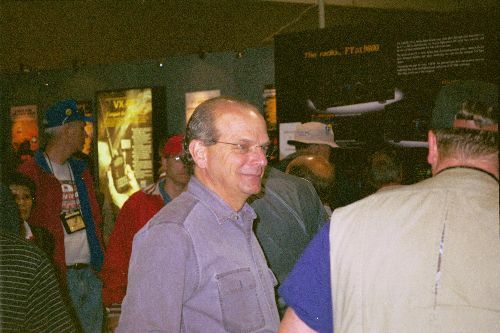 This years Dayton Hamvention 2006 was no disappointment to say the least. 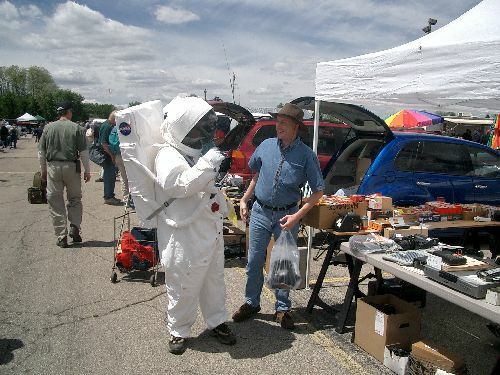 May 19th, 20th and 21st With ticket sales at some 20,000 all the movers and shakers involved in amateur radio were there showing off the latest in high performance rigs and accessories. Celebrating their 50th anniversary Vertex Standard better known as Yaesu Musen (Wireless) was there at the usual local and I was lucky enough to be a part of the crew for the event and in the presence of some of the brightest minds and nicest people you could ever care to met at the Yaesu exhibit. Left to Right back row our two day works Rebecca & Abbey passed out thousands of brochures, thousands of hats and other Yaesu collectibles. Passing out nearly 12000 50th anniversary hats, needless to say it will be a few years before they will become a truly rare item on Ebay! 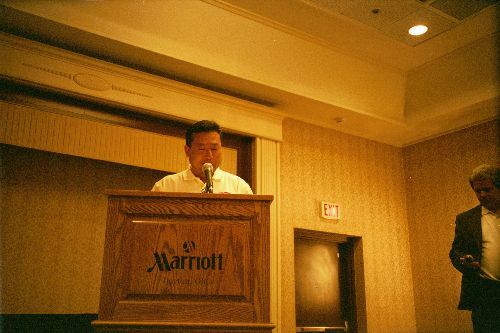 Next in line is Mr. H. Ogi, JH1WXT, senior engineering team leader responsible for the leading-edge technology found in the FTdx-9000, FT-2000 to name only a few. 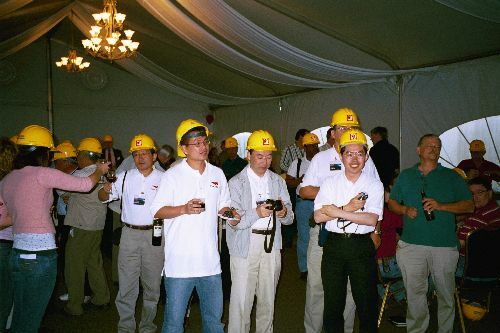 Forth from the left is Peter Lam KG6ULA, Yaesu USA Headquarters HF Super Technician. 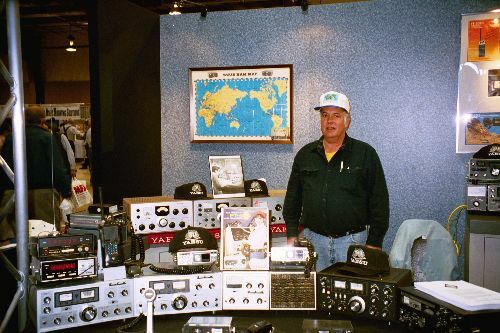 To the right of Peter is Ron Kelly KN6TE from the Yaesu USA Headquarters technical support team, you will often see Ron around the country at many of the larger amateur events showing off the latest in the Yaesu product line. 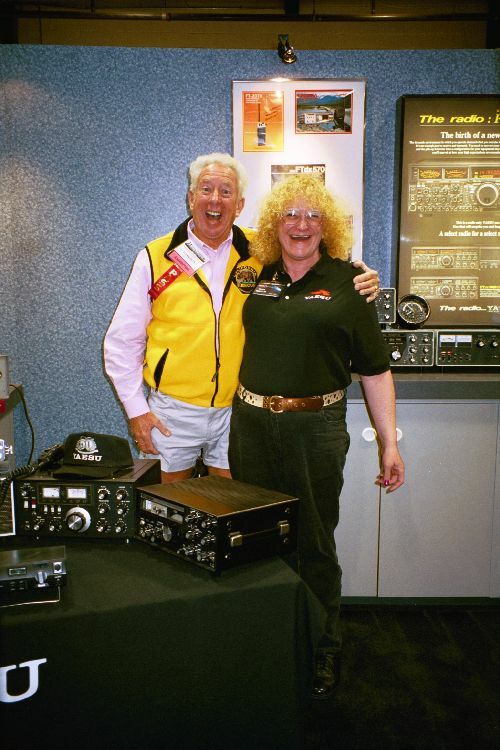 Sixth from the left is Ailsa Turbett, G7TJC, Yaesu's well known and appreciated sales representative from the United Kingdom. Ailsa is well known by amateurs both in Europe and the United States. Followed (Second from the right) by yours truly Carol W4CLM administrator of Fox Tango International. Back row furthest to the right is WA6F, Mr. Mikio Maruya, Executive Vice President of Engineering, overseeing all engineering departments Mikio is attached to the Amateur Division of Vertex Standard (Yaesu) U.S. Headquarters, Cypress California. In the front row far left we have Mr. T. Shinohara, JP1THK, Yaesu senior engineering team leader responsible for work on such projects as the greatest little QRP rig in the world, the Yaesu FT-817. 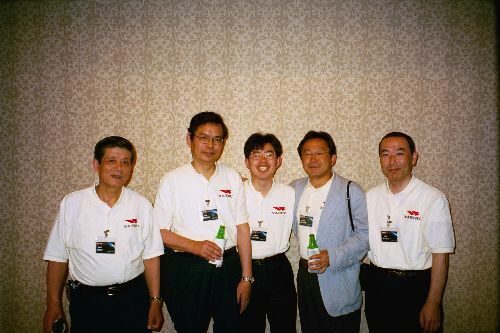 Front row second from the left we have Mr. S Fujiki JR1FPZ, Yaesu senior engineering team leader for all Yaesu hand VHF /UHF hand held radio products. 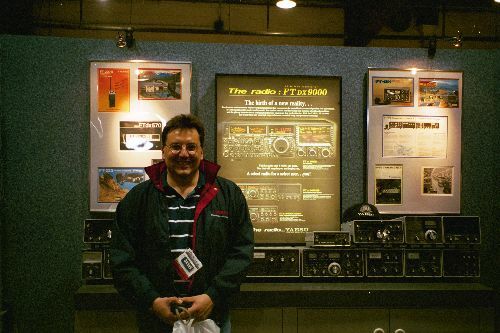 Mr. Fujiki is responsible for all hand held radio design and the first Yaesu fully synthesized two meter amateur transceiver the famous FT-207R introduced in 1979~1980. Front row center. The great leader! 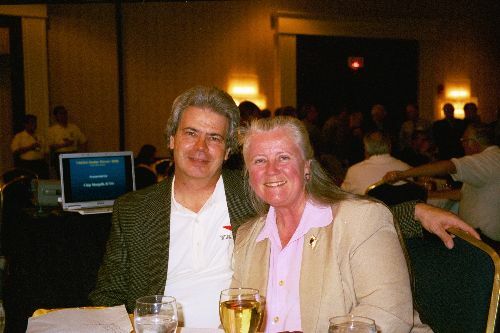 Yaesu USA headquarters, Chip Margelli K7JA oversees all of the Yaesu amateur division and I'm sure more then that when asked! 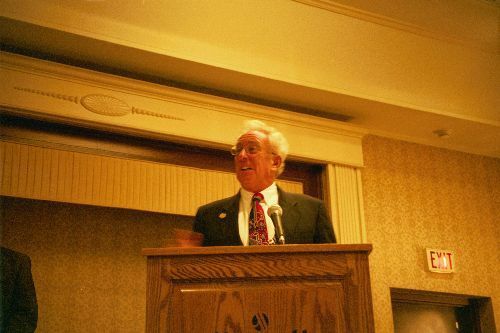 You will find Chips name in just about every service manual produced by the company and some times even his picture too. 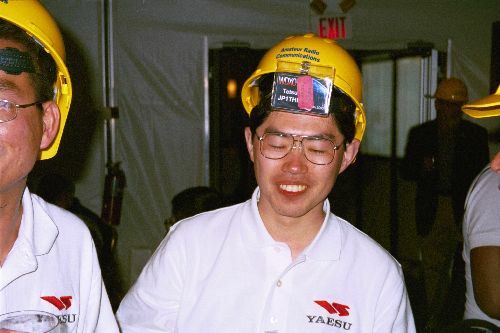 Chip is responsible for Yaesu USA headquarters technical support team and the design of all those wonderful sales brochures you have seen over the years. Front row second from the right is this happy fellow Jerry Darby, N6UME, from Yaesu technical support team, you will often see Jerry and Ron above around the country at many of the larger amateur radio events showing off the latest in the Yaesu product line. And this gentlemen appreciated my jokes in my half hearted attempt at doing so in broken Japanese language. Never did figure out if he was laughing at me or with me! In the front row far right we have MR. T. Ohtsu, JH1AJY senior engineering team leader and Yaesu mechanical engineer. Mr. Ohtus is responsible for just about any and everything when it comes to the transceivers mechanical engineering, gear drives, knobs, cosmetic features, cases and more, right down to the packing material used on the carton you receive when you open your new Yaesu product fresh from the factory box. 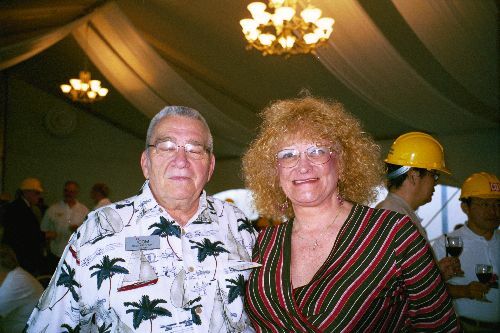 Lastly I believe the reason why you don't see this gentleman is that Bob (Motorcycle ~Bob) was most likely taking the pictures. 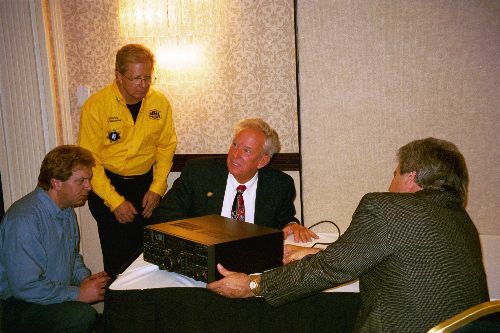 Bob did all the audio video production during the Dayton event as well as assisted the technical support team in demonstration of the latest Yaesu product line. 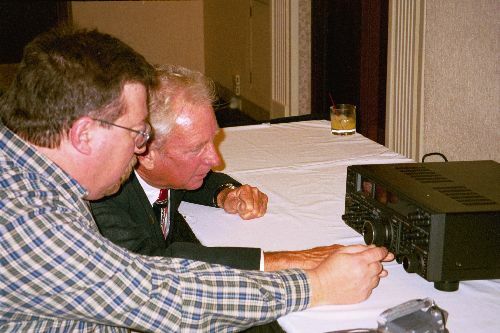 Some how we just couldn't seem to get Bob's hands away from that FTdx-9000D !! Hey Don! 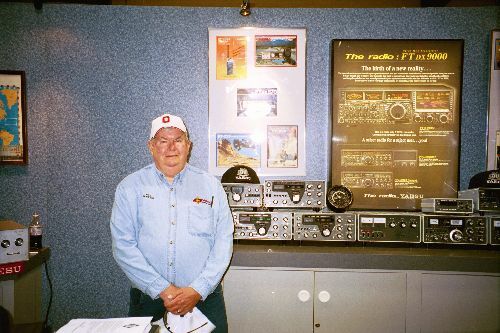 Don Pettit WD7P Electronic service technician for the Amateur Division of Vertex Standard (Yaesu) U.S. Headquarters, Cypress California. 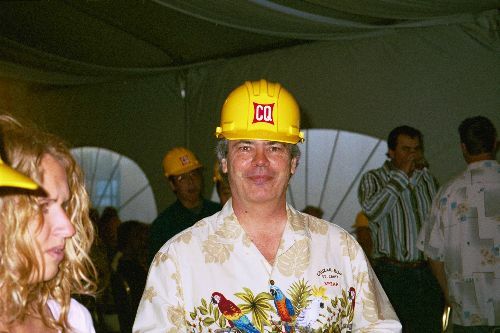 Now here is another guy who tried to sneak out of the photo. 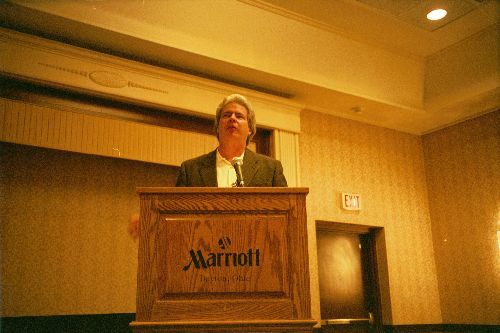 In fact you could not hardly get this guy to stop talking the whole Hamvention. If he said two words you had to drag it out of him! But don't let him fool you, Don is one smart cookie. 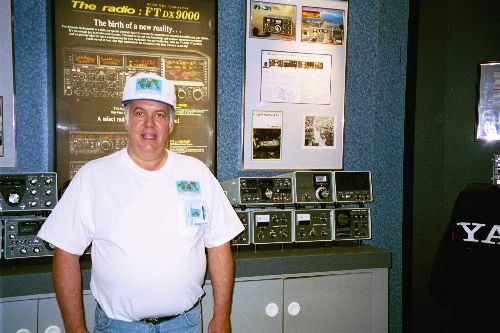 Needless to say next to the crowds around the new Yaesu FT-2000, one of the big hits in the Yaesu exhibit for the 50th anniversary was the vintage equipment display put on by Fox Tango International. 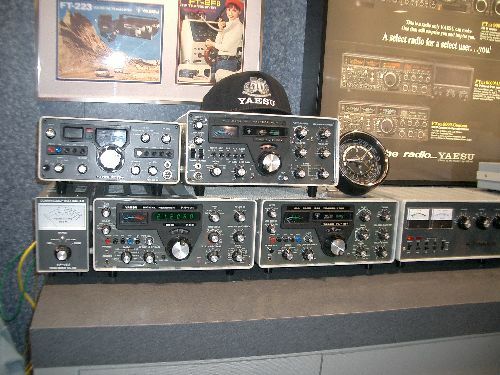 The equipment lineup included the hard to find (In the USA) FT-220 two meter transceiver, FT-201 HF transceivers and the Yaesu QTR-24 world clock still keeping perfect time on the top left row. 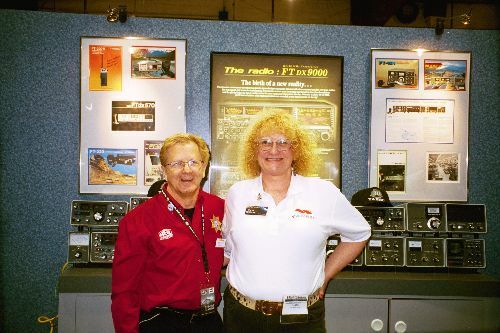 Bottom Row left to right we had the YP-150 dummy load watt meter, FR-101D receiver, FL-101 transmitter, FL-2100B amplifier, FT-101E HF transceiver, . 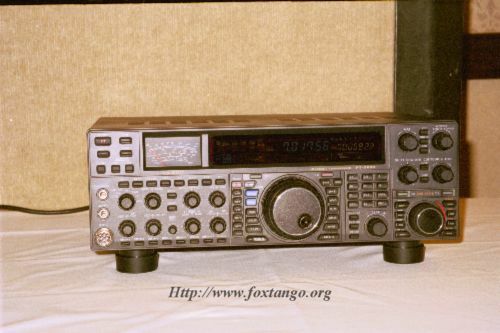 FTV-650B six meter transverter, FTV-250 two meter transverter, YO-100 monitor scope. 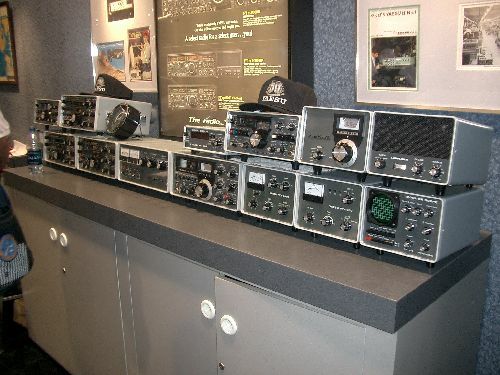 Top row far right the YC-601B digital display, pristine FT-620B six meter transceiver, FV-101B remote VFO and SP-101 speaker phone patch. 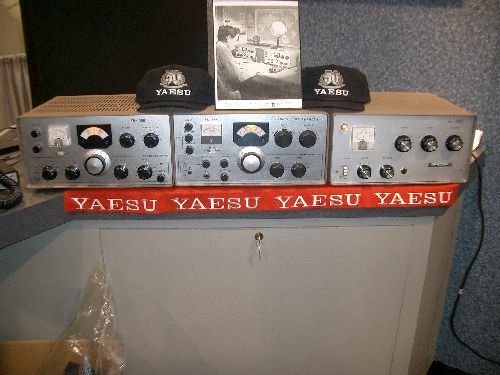 The equipment line was produced by Yaesu Musen (Wireless) for approximately ten years from 1969 through 1979 when Yaesu ended production of the FT-101 as we knew it. On the front displayed were perfectly working the FRdx-400 receiver, FLdx-400 transmitter, FTV-650 first six meter transverter (Circ. 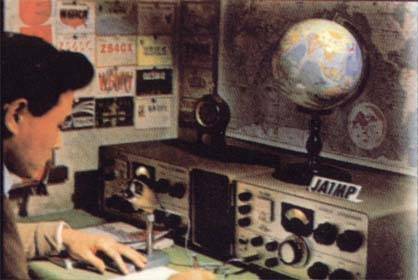 1966~1968), FTdx-100 (Circ 1969) and the Yaesu FT-200 /FT-250 known state side as the Henry Tempo One (Circ. 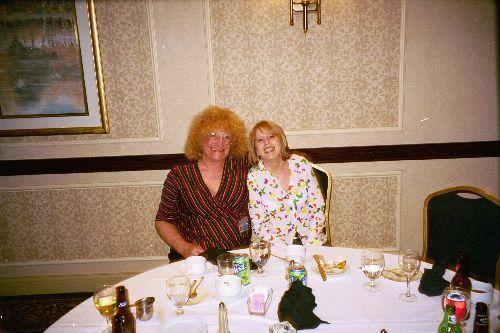 1972~1977) taking many on a trip down memory lane. On the VHF side of the house we had several early Yaesu crystal controlled VHF FM 2 meter transceiver the FT-2FB and the FT-223 that was sold briefly by Sears and Roebuck in the United States. And lastly in the VHF FM display we had Yaesu's first fully synthesized hand held radio the FT-207R with it's whopping ~4~ memory channels. Sometimes referred to as the brick or the battery eater, the FT-207R was a innovative step forward in the way of the two meter hand held transceiver as we know them today. It sold for $300 in 1979~1980 and with today's modern battery technology the transceiver ran flawlessly for the entire convention. 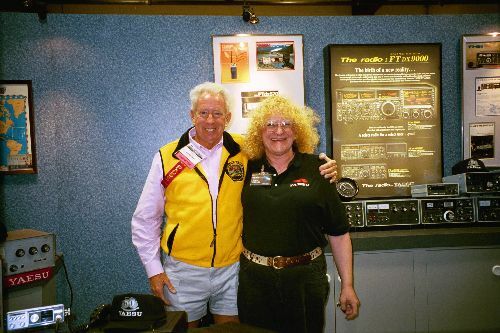 Lastly on display wads the Yaesu FT-227RB memorizer two meter transceiver and the FT-127 220RA Mhz memorizer and the more expensive 25 watt version the CPU-2500 that sold for $500 (Circ 1980). 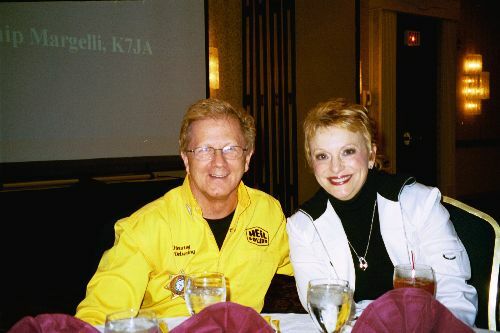 Chip Margelli K7JA, now and then! 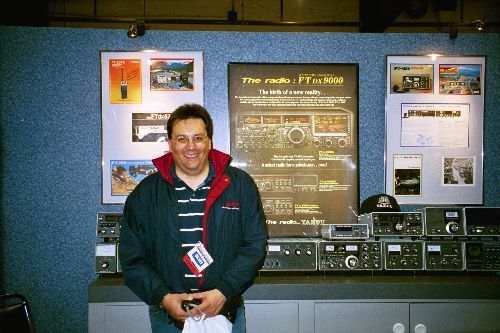 Everyone who entered the world of Yaesu exhibit had to pause before the Chip Margelli ~ FT-902 shrine. Bowing respectfully at the shrine, to the man and his accomplishments. This Bud is for you Chip! There was one heck of a nice spread of groceries,, enough for all! it just doesn't get any better then this! K9EID, Hey how did that get in here Bob? 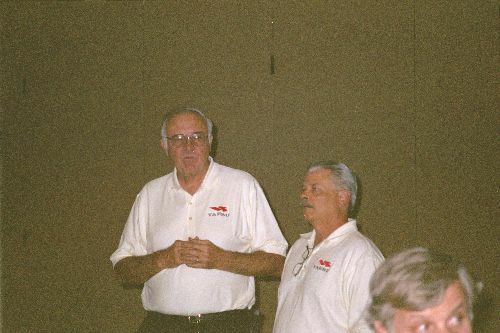 Left Photo: Mr. Gordon West WB6NOA doing introductions. Read about the FT-2000 here ! 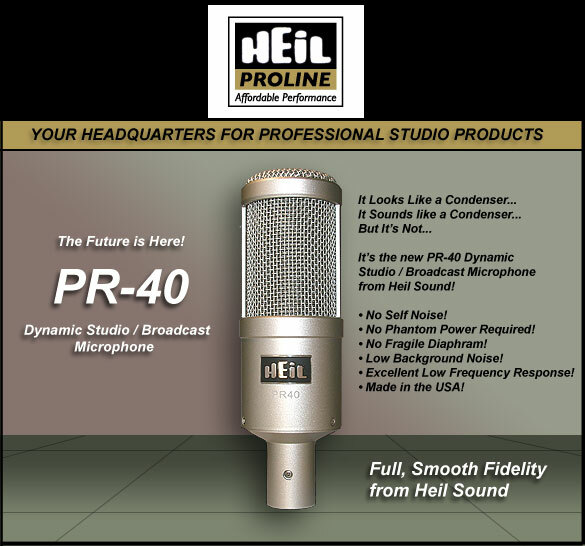 Left Photo: Bob Heil is already looking for ways to improve the audio. Maybe the addition of a nice PR-40 Bob! HF FT-2000 for the next CQ magazine! Another Saturday night and the gangs all here. 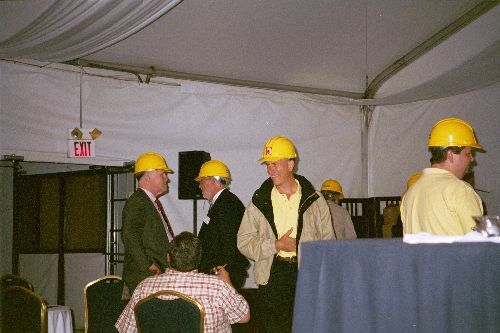 Men in hard hats doing the Y-M-C-A ~ it was a sight! 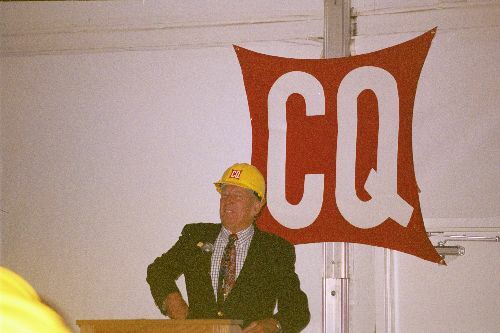 Mr. Gordon West WB6NOA doing the honors and jokes at the CQ party! Gordon should have been a politician, he's got all the lines and all the jokes! A good time was had by all! Do you think ? I hope the factory doesn't see this site! Mean While back at the Ranch! I mean Exhibit! Sunday Morning. Everyone was winding down, well sort of ! 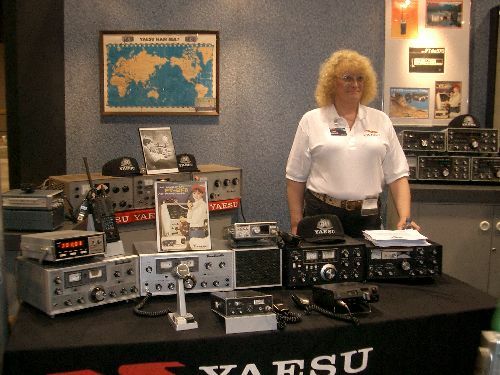 50th anniversary Yaesu Vintage Radio Exhibit. all the way from Grand Duchy of Luxembourg! Sorry if I missed any of you on this list. The Hits just kept on rolling and the fun didn't stop. how to quiet down an out of control party! Shut down those out of band Rigs ~ Quick Guys! 50th anniversary vintage Yaesu radio display and we had a nice QSO too! And that was the end of the party. home after the law man showed up!